Winstar is a new source for answering questions about kitchen remodeling or kitchen design. Do you have kitchen design questions? Looking for kitchen design ideas? Please visit our sponsors. That is how we afford to do this for free! Your best bet is to locate a designer with credentials. The National Kitchen and Bath Association offers a list of professionals in your area here: NKBA Here you can find nationally certified designers for kitchen and bath. Remodeling a kitchen? What can you expect? 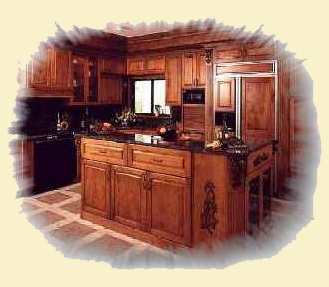 If you are remodeling a kitchen, and you are using custom cabinetry, expect to leave a deposit with your design firm. There are two popular formats followed by most companies. They are 50/40/10 and 40/50/10. What does that mean to you? It means that you will be expected to leave a 50% deposit when ordering, 40% payment when the cabinetry is delivered and 10% on completion or substantial completion. The term substantial completion is something you should understand. Many companies will expect the final payment on substantial completion. This means that the project is substantially complete, possibly missing a knob or a piece of molding. It is unfair to hold back thousands of dollars for a small item. However, if the company is not reliable, this payment system can cause undue heartache for the consumer. Since the company has received virtually all of their funds, there is no monetary incentive for them to return. This is why it is important for you to make sure you are dealing with a company with a good reputation. How can you determine if the company has a good reputation? The first place to look is their relationship with NKBA (National Kitchen and Bath Association). Members are supposed to keep to the standards of the NKBA. Secondly, look at your local BBB for advise. Most importantly, talk to your friends. If you know of someone who has had a kitchen remodel, ask them about their experience. Lastly, use your "gut" feelings! If you feel uncomfortable at all during the initial presentation, do not go forward. What should you expect before you make a buying decision? You should expect to see a designers portfolio. The portfolio should have before and after pictures, floor plans, letters from past clients. If the designer does not have a portfolio, we suggest you move on. Your designer should be able to give you a clear vision of what he or she can do for you as well as a price range for the project. Giving the designer a budget is the best way for you to lead your designer toward the best products and design for you. What you should NOT expect before making a buying decision. You should not expect to receive drawings. Sadly, the kitchen industry has lagged many of the professional industries such as architects. You would never expect an architect to produce drawings prior to engaging him or her in the form of payment. If your designer is a good designer, he or she should not be expected to work for free. What do you need to know in order to make a buying decision? Interestingly enough, making a buying decision is easy if you have the answers to all the questions required to make that decision. Often, designers fail to offer all the answers. This is why it can be frustrating for you, the consumer, to make an educated choice. Here is what you should look for. If you do not know about the company, do some research. The company is the most important factor in deciding where to make your investment. For example; if the company has a reputation for delays, or worse yet does not follow up on details, do you want to invest with them? The best designer working for a company with a bad reputation can be a disaster. If there is a catastrophic problem, can the company back up the designer? If there is an expensive problem, can the company afford to make things right? Here are just a few potential problems that we have seen over the years. These are just a few of the potential problems that can arise. Make sure the company you deal with can afford, and will be willing, to make things right in the event of an expensive problem. Does the designer have the capability of doing the project properly? The designer should have some schooling. Ask to see credentials. Look at their portfolio. They should have before and after photos of projects they have managed. Also ask for referrals. Most importantly ask for at least one referral where there were problems. The character of a company is measured by what they do when there is a problem. Does the company have products you like? Will the project fit your budget? Don't be bashful. The biggest waste of time is when consumers hide their budget. If you give your budget to a reputable firm, you can be assured that you will receive the best value for your investment. If you have no idea what to budget, ask! Your designer should be able to give you reliable price range estimates on your project on the first meeting. This ability is the sign of a seasoned pro! 1. Make sure you have a prep area near your cook top. You might want to have a prep sink in this area. All too often people underestimate how much a prep sink will be used. They also underestimate the size this sink should be. I would recommend nothing smaller than an 18" sink, preferably a 24" sink as minimum sizes. If you can, consider a workstation sink as your food prep sink. 2. Think about trash and recycling storage. Some sink designs with offset drains will allow you to put the trash bin slide out mechanism inside the sink cabinet. This will not only save you money, but it will put the trash storage right at the location where the trash is generally generated. 3. Molding makes the kitchen look amazing. Make sure you spend time looking at options for molding at the top of the cabinets, underneath the upper cabinets and around the base cabinets. 4. Don't date your kitchen. There are trendy selections that can "date" your kitchen. If you are investing in quality products, invest in something that is timeless if possible. For example, pickled cabinets were the rage in the 80's. The tried and true raised panel wood doors without a trendy finish is a long time investment that will pay off. Email us with your questions and we will answer as quickly as possible.